Karabagh rugs (also spelled Karabakh) were woven in the Karabagh region of the southern portion of the Caucasus mountains in present-day eastern Armenia and southwestern Azerbaijan, just north of the present Iranian border. The region encompasses three areas: Highland Karabagh (historical Artsakh, present-day Nagorno-Karabagh), Lowland Karabagh and a part of Syunik. Karabagh refers to a region, not an ethnic group. The population is mainly Armenians and Azeri Turks. In the larger cities of mountainous Karabagh, the population is mostly Armenian. Because the region is split between Armenia and Azerbaijan, as well as between Muslim and Christian and highland and lowland, war and upheavals of its local population has had a long and sad history. The Karabagh region has long been a center of Azerbaijani (Azeri Turks) arts and culture, since ancient times.The history of the Armenian weavers goes back well into ancient times as well. Rug weaving had been taking place in this area as far back as the early 13th century. Evidence of weaving crafts has been found at excavations of archaeological sites dating as far back as 2500 BC. Karabagh rugs were among the most prominent exports of the Caucasus region to medieval Europe. 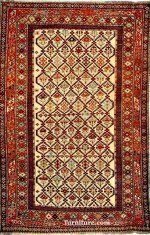 These were the precursors of the rugs we refer to today as antique Karabagh rugs of the 19th and early 20th centuries. This region was at this time one of the most significant rug-producing centers of the world. 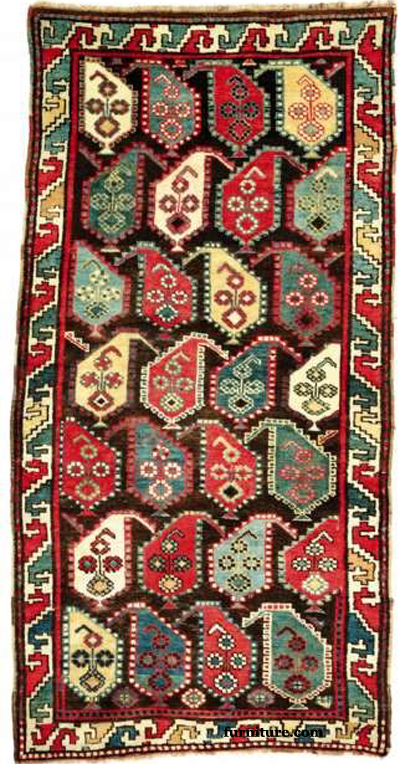 Rugs were generally woven in small workshops or individual homes in the small villages where the different ethnic groups lived during different historic times. Unlike many other rural communities, woven rugs were important symbols of wealth, not just utilitarian crafts. Weaving was considered an essential skill for women, who began learning to weave at age 6 and were expected to weave at least one piece as part of their dowry. Each family was expected to weave at least one rug per month. Weaving would be the main vocation for a girl's whole life. At their death, their hook, comb, and scissors tools, and their looms were engraved on their tombstones! The breeding of the white-grey colored wool of the sheep grew tremendously at the turn of the 19th and 20th centuries. The dyeing skills of the local weavers was extremely important. These experts had to be able to distinguish colors clearly and know how to get the right color from plants and trees. Often, the vivid magenta-colored field of the early Caucasian Karabagh rugs was considered to be too strong for the Western buyers. This was changed by a chemical process to a dark black-brown color. Unfortunately, because of the iron oxides in the dye, the pile in the field tends to wear down faster than the rest of the rug's pile. Antique Karabagh rugs have probably the oldest and most varied patterns of all Caucasian rugs. Their elegance reflects the Armenian and Azerajiani cultures and old traditions.The designs could be woven from a pattern or made freely from the weaver's own imagination. These rugs have longer pile than other Caucasian rugs and are typically more coarse. The weave is distinctive in that it features a double weft between every two rows of knots. Those that descended from Caucasian rugs of the 18th century. These feature tribal geometric and medallion motifs in earthen colors with a lot of folk art, such as small animals. Those closer to Persian rugs with bolder color palettes and Persian designs similar to the Kazak rugs of northern Iran. 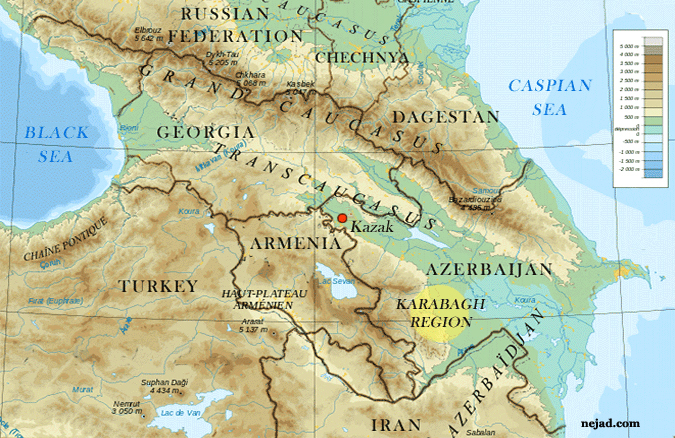 There are Armenian and Azerbaijani types of Karabagh. It is very difficult today to determine which ethnic groups actually wove a particular Karabagh rug since all these rugs are given the name 'Karabagh' in the trade. 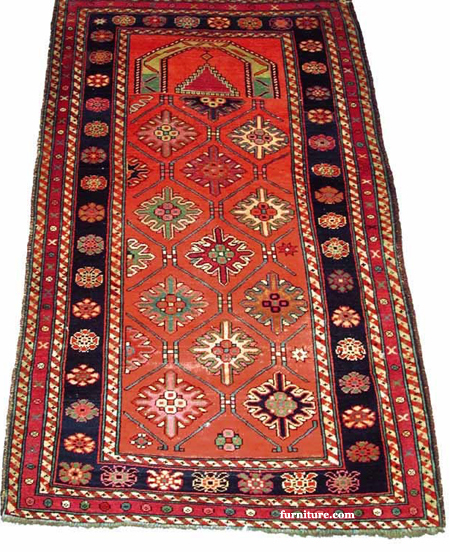 Armenian rugs were extremely diverse in their style and color. They contained geometric fields, medallions, and motifs. But there were also crosses, human figures, and geometric bird and animal figures that are not usually found in non-Armenian rugs. These may have had religious significance since they are consistent with motifs found in Armenian churches and monasteries. 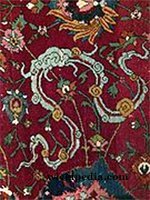 Some of the motifs used in Armenian rugs may have been the result of contact with India and China as early as the 4th century AD. Some of these motifs include figs, Asoka trees, pine cones, turtles, serpents, and birds. Armenian inscriptions are an important part of the whole design and give information about both the weaver and the date of the completion of the piece. Red cochineal dye was first produced by the Armenians. These were divided into 4 categories: Quba-Shirvan, Genje-Kazak, Karabagh, and Tabriz. Each was different from the rest all depending on different cultural backgrounds, materials available, and local weaving traditions. 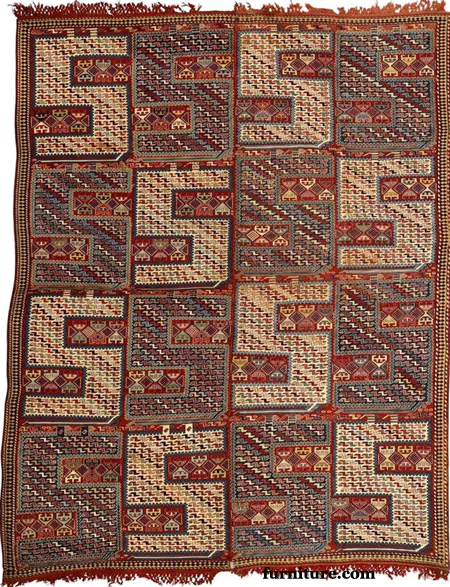 Weavers in the Azerbaijani Karabagh region were known for the 'rug set' which was a central rug approximately 13' x 26' long and 6.5' wide along with 2 side rugs the same length of the central carpet and approximately 3' wide. Head and bottom pieces were sometimes added. 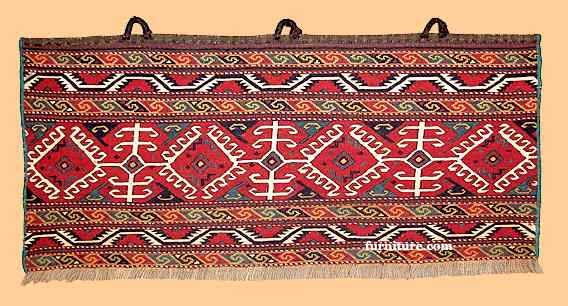 Along with the piled Karabagh rugs, these pileless flatweave weavings were also well-known in the region. Palas, Farmash,Kilims, etc. were made into mats, saddlebags, and salt bags. For example, the Palas was a thin, pileless mat that could be made quickly and cheaply for everyday heavy use. Kilims had traditional patterns and motifs such as the apple, brick, hand, devil chain, tray, bird, fish, and horseshoe. The Verni was the most widespread type of the pileless flatweave kilim rugs. It's key features were the S-element and vivid bird images as well as the way in which it was woven allowed the pattern to appear on both sides. This rug was thought to protect the family in a home from foul weather. Caucasian rugs are not classified based on patterns as are Persian and Turkish rugs. This is because the rugs were commonly traded and rug patterns were widely dispersed and copied. 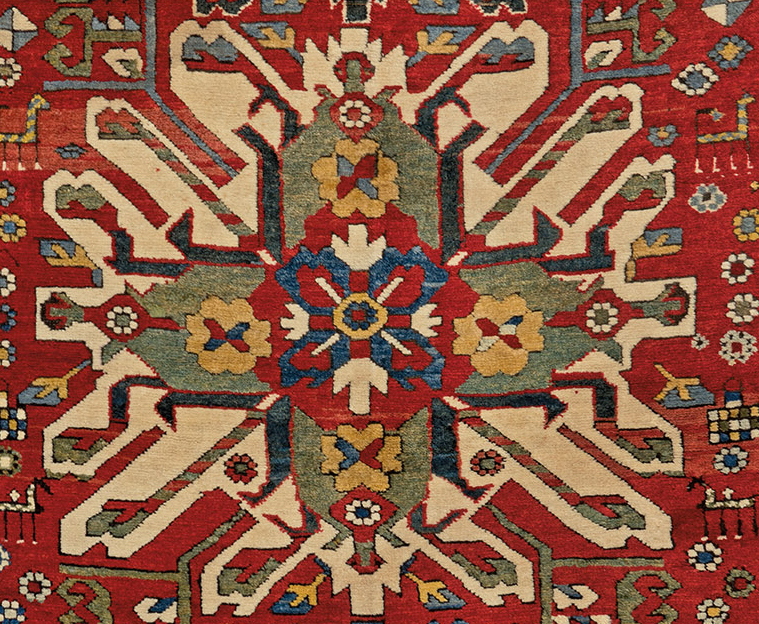 More than thirty distinctly unique Karabagh rug designs and compositions have been identified, many completely original. The designs and color schemes (typically magenta, turquoise, and pale green) tended to be more like those of Persian rugs because of the close proximity to Iran. It is sometimes difficult to distinguish Karabagh runners from those of Karaja in Iran. Eagle or Sunburst and Cloudband Kazak patterns are actually woven in the Karabagh region. 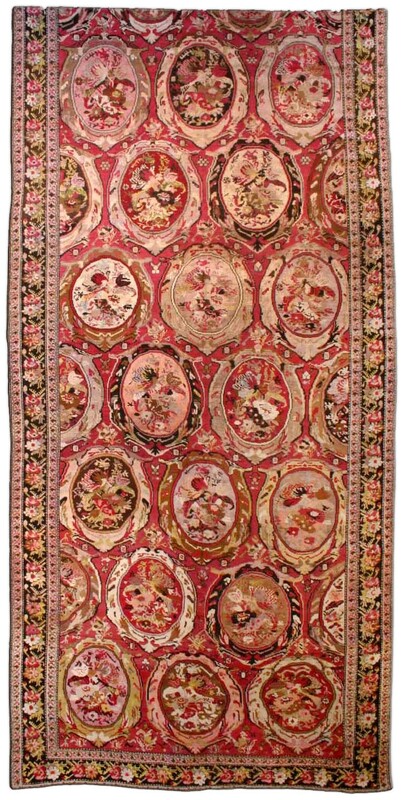 The antique rugs were rose patterned, with geometric pink and red flowers in bouquets arranged in garlands with swags on fields of dark blue or black. The name 'Karabagh' can be loosely translated as 'black garden,' and many of the antique rugs had black fields or borders filled with ornamental flowers. The borders of the Karabaghs showed as great a diversity as the main fields but a primary strip may be a Persian design with a running latchhook or crab design on each side. An adjacent strip may be simply a running vine. Other decorative ideas and motifs were appropriated from many different societies including Persia, Russia, Mongolia, Turkey, and Arabia. Included in the designs were the heavy curving bands of dragon rugs with a central medallion. Pole medallion arrangements were based on Persian rugs. Mirror Karabaghs have oval medallions enclosing bouquets. Turtle medallions can also be found which are derived from the oval arabesque medallions in Persian and Turkish rugs. Although there are so many different styles of Karabagh rugs, there are many symbolic motifs that can be commonly found in all Caucasian rugs. Wheel of Life. This mandala appears in many cultures and it shows the cyclical nature of life. It is a reminder to embrace life's ever changing events in order to grow. The latchhooks around the wheel are associated with the dragon symbol (masculine heavenly figure). Occasionally, small stars could be found within the wheel as well. The Boteh has many interpretations and is the precursor of the Indian paisley. It is sometimes interpreted as a flame as well. The tribal weavers considered it to be a sprouting seed. To the Caucasian tribes, it symbolized the potential growth and abundance that could be possible even under adverse living conditions. If a boteh encloses a mature plant inside, it symbolizes the whole always exists within the part. The Gazelle was admired by the tribes for its virtues of grace, fleetness, and dignity, attributes they continuously worked to cultivate within themselves. The Ram's Horn symbolized warmth and comfort as the wool of the sheep was central to the livelihood of the tribe. The ram's horn has also been used to summon groups together throughout history. It symbolizes strength, power, fertility, and the suggestion that life is not temporary, but eternal. The Rosette symbolizes cultivated flowers. With this cultivation, man has refined and purified nature and is in harmony with the laws that govern Heaven and Earth. The 'S' Symbol can represent the dragon, the masculine heavenly principle of life. But it is also possible that it comes from the Zoroastrian symbol for the sun. The sun is always shining and always nourishing all things. The 'S' motifs can often be found scattered throughout the field of some antique tribal rugs. The Star of Wisdom is one of the oldest symbols. The 8-pointed star symbolizes man's potential for inner wisdom and the true wealth which could be obtained through the striving that must be made to face the many challenges of daily activities, especially for the weavers. The Dragon symbolizes the heavenly influence that is on Earth. It animates life and can be seen in all things. It is often paired with the Phoenix, which is the feminine or earth element. The union of the dragon and phoenix can also be interpreted to depict the union between the mind and heart of man. The Running Water symbol reminds us of the life-giving quality of water for people and their animals. Anything that nurtured life was considered to be sacred. The Bird symbolizes the potential that humans have for freedom from human boundaries, the freedom of consciousness, and the boundless joy of the heart. The Fence of Security signifies that what is most valuable is also most vulnerable and must be protected and respected. A double-edged fence may also suggest that man's essential life is untouched by the outer events of life. The peacock is associated with nobility and abundance. A level of heavenly beauty and splendor that can also be found on earth. The tribes people believed this beauty to also exist in the depths of the human heart. 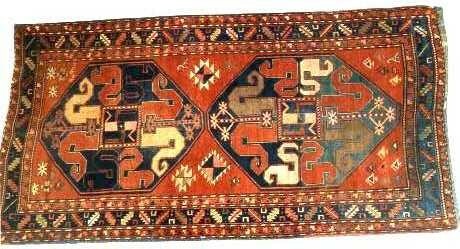 Those rugs produced in the latter part of the 20th century resemble Kazak rugs but typically come in smaller sizes and nearly square shapes. The colors were primarily red, blue, yellow, and ivory. The symmetrical knots were not tightly pressed down, thus they were not as finely woven. The foundation is usually wool and the designs geometric motifs. Often the central field can be left open or empty, lacking the sought after intricate tribal motifs. Unfortunately, the production of rugs and the art of weaving no longer takes place in the Karabagh region. The ethnic cleansings and war have almost completely destroyed the weaving tradition. 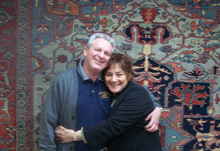 ABC Oriental Rug & Carpet Cleaning Co.
New informative articles every month. Rugs on the wash floor are gently scrubbed before thorough rinsing. Gentle scrubbing continues. Note the wringer in the background-the next step in the washing process after rinsing. After thorough rinsing, the rug is sent slowly and carefully through the wringer to take out as much of the water as possible before being hung on racks in the drying room. Rugs are hung on a rack in the temperature controlled drying room until completely dry.